The Minas Gerais city of Diamantina was a center of European culture with a thriving economy during Brazil’s colonial period. Gold and diamonds attracted hordes of explorers from all parts of Brazil and beyond. However, once the mines were depleted, work opportunities were few and far between – similarly to what has happened in the nearby Jequitinhonha Valley. Also in Diamantina, craft played a very important role in the local economy. The wool rugs of Arraiolos, a small town in Portugal, are made with a needlework style that is inspired by Persian carpets, since the Middle Ages. But it wasn’t until quite recently that this craft style became known – and made – in Brazil. Known simply as “tapete arraiolo” in Brazil, the rug-making technique was introduced in the 1970s through to an initiative of the then archbishop of Diamantina, who sought to create work for the impoverished housewives of the region. Maria de Fátima Nsacimento (pictured above) was one of the first women to get trained up by a group of Portuguese artisans back then and ever since she made her first piece at the age of 18, she made arraiolo rug-making her main occupation. “[Learning how to make rugs] was something that really saved my family. I had two small children to look after on my own as my husband passed away, and no income at all. My life literally changed after I learned those skills,” says Fatima. Nowadays, Fátima is the vice-president of the local craft association, which has a shop in central Diamantina, the main sales outlet for her own items and those made by dozens of other artisans from the town and surrounding districts. The shop caters mostly to tourists and sells a total average of R$100 ($44) a day and artisans pay a percentage of the goods sold towards the costs of running the shop. Fátima’s items, which are more expensive, don’t sell as much: she manages to sell an item or two a week, if the town is busy. The materials employed to make arraiolo rugs are also quite expensive, so the crafter has to do quite a lot of juggling to make ends meet. “The things I make take a long time to complete and sell, and the materials I use like the jute and the wool are quite pricey. So I have to be creative – pay some bills here, some there, then when there is a bit of cash left, I can get what I need to do my work,” Fátima says. 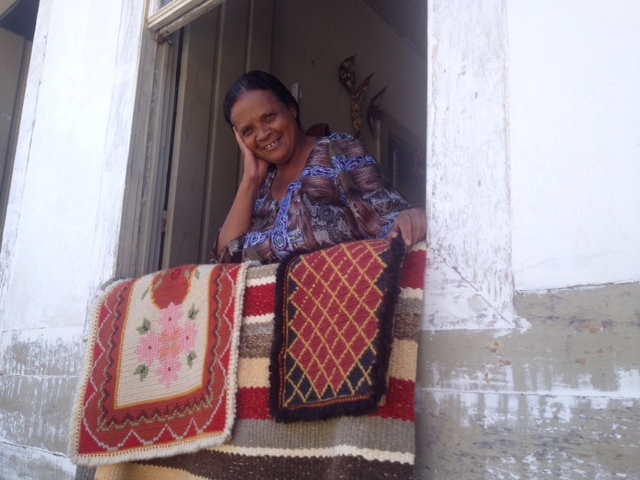 If Fátima is working on her own, a full-sized lounge rug can take up to a month to complete. It is a time-consuming job and making rugs would not be enough for her to survive, so she also washes and restores rugs that customers from the region and elsewhere bring to her. The maker confesses that she feels an inch of sadness when she learns that resellers from big cities, from Belo Horizonte (the capital of Minas Gerais state, 190km from Diamantina) or São Paulo buy her items for very low prices and sell them for a lot more elsewhere. “My work is surely selling for a lot more out there, somewhere. But the problem is that I just don’t know how to reach the people that would appreciate what I do,” Fátima says. Despite the difficulties, Fátima likes to reinforce the point that she is grateful to have the needlework skills that pulled her out of real poverty some 40 years ago and allowed her to juggle child rearing with the demands of everyday life. “Sure, I chose to do this work but I love arraiolo because to me, it is more than just making pretty things. It something that helped me a lot,” Fátima says, with a bright eyes and a big smile on her face. Check out Fátima Nascimento’s items for sale at Gift Brazil here.